Elders have a weighty responsibility within God's household. That is why James wrote: "Not many of you should become teachers, my brothers, knowing that we shall receive heavier judgment." (James3:1) And the apostle Peter counselled the elders to, "Shepherd the flock of God in your care, not under compulsion, but willingly; neither for love of dishonest gain, but eagerly; neither as lording it over those who are God’s inheritance, but becoming examples to the flock." (1 Peter 5:2,3) Yes, the time will come when Jehovah will hold the shepherds accountable for how they dealt with his sheep. “Woe to the shepherds of Israel, who have become feeders of themselves! Is it not the flock that the shepherds ought to feed? The fat is what you eat, and with the wool you clothe your own selves. The plump animal is what you slaughter. The flock itself you do not feed. The sickened ones you have not strengthened, and the ailing one you have not healed, and the broken one you have not bandaged, and the dispersed one you have not brought back, and the lost one you have not sought to find, but with harshness you have had them in subjection, even with tyranny. And they were gradually scattered because of there being no shepherd, so that they became food for every wild beast of the field, and they continued to be scattered. My sheep kept straying on all the mountains and on every high hill; and on all the surface of the earth my sheep were scattered, with no one making a search and with no one seeking to find. The shepherds of God's people will receive heavier judgment, as James wrote, for God will ask his sheep back from them. Their excuse of having been obedient to those taking the lead, the governing body, will be in vain, for they should have been obedient and submissive to our Great Shepherd, Christ Jesus. "What will separate us from the love Christ has for us? Can trouble, distress, persecution, hunger, nakedness, danger, or violent death separate us from his love? As Scripture says: 'We are being killed all day long because of you. We are thought of as sheep to be slaughtered.' The one who loves us gives us an overwhelming victory in all these difficulties. I am convinced that nothing can ever separate us from God’s love which Christ Jesus our Lord shows us. We can’t be separated by death or life, by angels or rulers, by anything in the present or anything in the future, by forces or powers in the world above or in the world below, or by anything else in creation." ―Romans 8:35-39; GOD’S WORD Translation. Although we yearn to be healed now, Jehovah is not going to do that at the present time. He has an appointed time for it. He wouldn't even do that for Paul, in spite of Paul's many pleadings. But he did help Paul to endure, even prosper, in spite of his "thorn in the flesh." Paul had the power to cure others, yet he couldn't cure himself. (Acts 19:11,12; 2 Cor. 12:7-10) Jehovah hears the cries for help of his people, and assists them to endure the present pain and suffering, or depression, or whatever might become a cause for stumbling. Jeremiah was often depressed, not only on account of the rejection of God's message that he was commissioned to preach, but also because of the opposition and persecution, being ostracised by his own people. In fact, he even decided to quit, saying: "I am not going to make mention of him, and I shall speak no more in his name." (Jer. 7:27,28; 12:1,2; 20:7-11) Is that how you feel at times? Jehovah will not hold that against you, for he understands how you feel. Jeremiah found much comfort in knowing that Jehovah is a caring and merciful God; and that it is due to "the acts of loving-kindness of Jehovah that we have not come to our finish, because his mercies will certainly not come to an end. They are new each morning." (Lam. 3:22,23) When you cry out to Jehovah for help in the morning, please be assured that he will help you make it through the day―one day at a time. His "mercies will not come to an end" for he will not abandon us, until the day when we are all healed. You have Jehovah's promise that one day you will be able to look back and sing his praises with thanksgiving for having carried you through the toughest times; to experience the real life, living every day to the fullest with joy and happiness, free from any pain, anxiety, suffering, and depression. At that time you probably won't even remember what it was like way back when―in our present day and situation; and how fleeting the time really turned out to be. "For here I am creating new heavens and a new earth; and the former things will not be called to mind, neither will they come up into the heart." Yes, "the former things have passed away." (Isaiah 65:17, 21-25; Rev. 21:4) In the meantime, you might find some comfort in knowing that the problems we are experiencing within God's household were foretold for the time just prior to Jesus' presence. "But as these things start to occur, raise yourselves erect and lift your heads up, because your deliverance is getting near." (Luke 21:28) Hang in there! The apostle Paul says that "these things went on befalling them as examples, and they were written for a warning to us upon whom the ends of the system of things have arrived." (1 Cor. 10:11) We must take that warning to heart, for belonging to God's household is as conditional today as it was in Jeremiah's day—it requires that we listen to Jehovah. 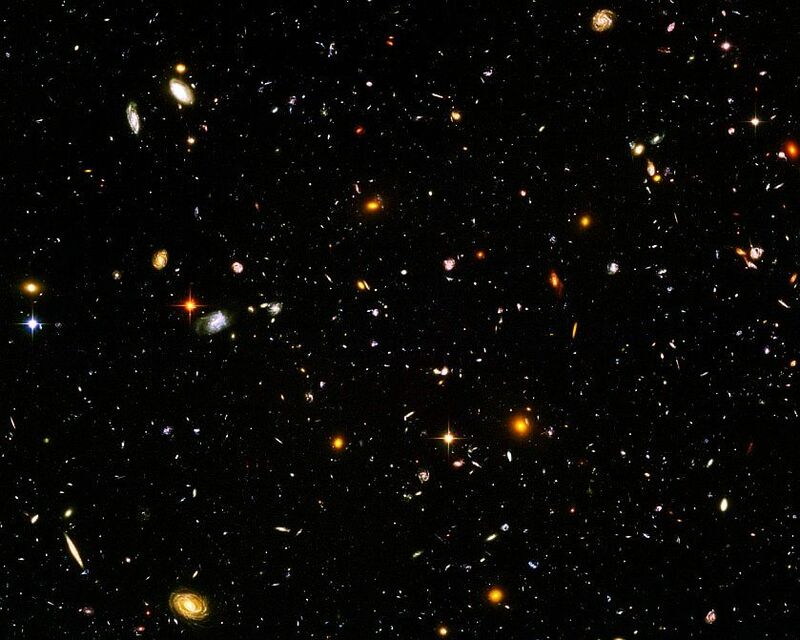 Have you ever wondered: Where does the universe start, and where does it end? If there is a limit to its size, what exists beyond it? 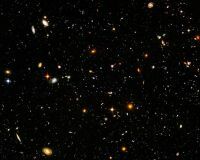 The universe that is visible to the most powerful telescopes, is so enormous that distances are measured in light-years, which is the distance that light travels in one year, namely, 10 trillion km. Consider, it would take 4.24 light-years to travel to Proxima Centauri, the nearest star outside our solar system, speeding along at 300,000 kilometers each second. Our own galaxy, called the Milky Way, is about 150,000 light-years across; and the closest galaxy to us is the Andromeda Galaxy, which is 2.3 million light-years away. Can you comprehend the power and wisdom of the One who created it all? Why is this of interest to us? Because, for one thing, it answers the age-old question, "Where do we come from?" But even more important, we are shown that the Creator of the universe wants us to get to know Him; even inviting us to have a personal relationship with Him. He cares for us, having created man in his own image. He is our Father, and we are his children, his "sons and daughters." (Gen. 1:26,27; Isa. 43:5-7; 2 Cor. 6:18) Our Creator has a name. He himself tells us: "I am Jehovah [YHWH]. That is my name." (Isa. 42:8) When God commissioned Moses to lead his people, the children of Abraham, out of Egypt, God told Moses: “This is what you are to say to the sons of Israel, ‘Jehovah the God of your forefathers, the God of Abraham, the God of Isaac and the God of Jacob, has sent me to you.’ This is my name to time indefinite, and this is the memorial of me to generation after generation." It was in Jehovah's name that Moses led the Israelites out of Egypt. For that reason, the covenant with Adam is often referred to as the "covenant of works," or "covenant of life." EASTON'S BIBLE DICTIONARY says: "COVENANT OF WORKS, the constitution under which Adam was placed at his creation. In this covenant, (1.) The contracting parties were (a) God the moral Governor, and (b) Adam, a free moral agent, and representative of all his natural posterity (Rom. 5:12-19). (2.) The promise was "life" (Matt. 19:16, 17; Gal. 3:12). (3.) The condition was perfect obedience to the law, the test in this case being abstaining from eating the fruit of the "tree of knowledge," etc. (4.) The penalty was death (Gen. 2:16, 17). This covenant is also called . . . a covenant of life, because "life" was the promise attached to obedience; and a legal covenant, because it demanded perfect obedience to the law." Jesus was quoting Moses' words to the nation of Israel, God's people, who were poised to enter the promised land. It is of interest to note that by saying "it is Jehovah (YHWH) your God you must worship, and it is to him alone you must render sacred service," Jesus was at the same time reminding Satan that Jehovah is your God also; for Satan, who was at one time the beautiful and wise anointed covering cherub―until his rebellion in the Garden of Eden―owes his existence to Jehovah, "from whom all fatherhood, earthly or heavenly, derives its name." (Ezek. 28:13-19; Eph. 3:15, Phillips) Immediately upon the rebellion, Jehovah decreed that there could never be friendship, accommodation, or any sort of rapprochement between Satan's world and his own loyal worshipers. (James 4:4) This simple basic truth has caused certain confusion among many of God's people today. Yes, many have come to realize that the foretold "man of lawlessness" is situated right inside God's household; and not only that, in his position of power and authority he has also been teaching outright lies, thereby making God's word invalid. (2 Thess. 2:3-12; Matt. 15:7-9) This has caused them to wonder: "How are the lies taught by the Society's governing body any different from the lies taught by the religions of this world, notably Christendom's?" The apostle Peter wrote: "However, there also came to be false prophets among the people, as there will also be false teachers among you. These very ones will quietly bring in destructive sects and will disown even the owner that bought them, bringing speedy destruction upon themselves. Furthermore, many will follow their acts of loose conduct, and on account of these the way of the truth will be spoken of abusively. Also, with covetousness they will exploit you with counterfeit words. But as for them, the judgment from of old is not moving slowly, and the destruction of them is not slumbering." ( 2 Peter 2:1-3) Peter is not describing false prophets of this world, of which Satan is the god, but the false prophets among God's own people. (2 Cor. 4:4; Ezek. 13:2-10) Do you have difficulty reconciling the fact that there are "wicked men and impostors" found within God's household, even in positions of oversight? Does that stumble you, perhaps viewing God's household as no better than the world of which Satan is the ruler? Almost two thousand years after Jesus said these words, we can look back over the centuries and see that there have indeed been many who claimed that Jesus' return was imminent; even during the time of the apostles. (2 Thess. 2:1,2) More recently, for the past 100 years, the Watchtower Society has sounded the message that the due time is not only near, but arrived in 1914; at which time Jesus is said to have returned in kingdom glory in the heavens, invisible to mankind on earth. Not as well known is the fact that for forty years prior to 1914, Charles T. Russell, the founder of the Watchtower Society, preached―along with many others―that Jesus was already present since 1874. But Russell was unique in claiming that the kingdom was near and would be established in 1914, at the end of "the gentile times," according to his calculations. He expected that all the saints would be taken up to heaven that same year to rule with Christ in his kingdom. As we now know, time proved Russell's predictions regarding 1914 wrong,―they did not go to heaven that year; and World War I did not lead into the battle of Armageddon. After Russell's death in 1916, his conclusions and how he arrived at them, needed to be re-interpreted by his successors; and thus we have Rutherford's teaching on the matter, which has changed little over the past seventy-five years or more. Dr. Orestes Brownson, (1803 - 1876), once famously stated regarding his former religion―of which he had been a minister: "It is proverbial among [Unitarians] that the Bible is like a fiddle on which a skilful performer may play any tune he pleases." Since then, many others have adopted a similar opinion of the Bible. Is it true that the Bible is like a fiddle on which any tune can be played; meaning that a skilful preacher can support any teaching or doctrine by Scripture? William Lloyd Garrison, a prominent American journalist, and contemporary of Brownson, wrote in answer: "The Bible does not change, but the interpretations of the Bible are constantly fluctuating. Those interpretations are generally in accordance with popular opinion and the spirit of the interpreters. Men who are warlike,―men who deem it no sin to enslave their fellow-men,―men who are for retaliating injuries done to them,―men who are fond of a ceremonial religion,―naturally interpret the Bible in accordance with their views; while men of a opposite spirit construe its language in favor of perfect goodness and universal love." (Selections from the writings and speeches of William Lloyd Garrison, Volume 3) The great number and variety of denominations and faiths within the realm of Christendom, which claims to be guided by the Bible, has given rise to the belief that all religions are equally valid and just different roads leading to salvation. Everyone is invited to "attend the church of your choice." Many former JWs have come to adopt a similar attitude because they discovered that the Society, in which they had put their faith, has also been fiddling their "own tunes"―so to speak―over the decades, making changes to their teachings whenever deemed convenient or necessary. They no longer believe that it is possible to know the truth that Jesus and the apostles taught, and as explained in the Scriptures. (John 4:23,324; 18:37,38; 17:17) No longer believing that God has a people who make up his household, they are drawn to organizations whose message appeals to most people, by "tickling their ears." (2 Tim. 4:3,4; 2:19; 1 Tim. 3:14,15; Mal. 3:14-18) The pamphlet, "We are Unitarian Universalists," distributed by the UUA, invites such ones: "Are you looking for a religious home? Unitarian Universalists say: 'I want a religion that respects the differences between people and affirms every person as an individual." --- "I want a church that values children, that welcomes them on their own terms—a church they are eager to attend on Sunday morning." --- "I want a congregation that cherishes freedom and encourages open dialogue on questions of faith, one in which it is okay to change your mind." --- "I want a religious community that affirms spiritual exploration and reason as ways of finding truth." --- "I want a church that acts locally and thinks globally on the great issues of our time— world peace; women's rights; racial justice; homelessness; gay, lesbian, bisexual, and transgender rights; and protection of the environment." How real is God to you? When you find yourself overwhelmed with anxiety, and you take all your cares to Jehovah in prayer, do you feel afterwards relieved in the assurance that he has heard your prayer and that he will act on your behalf? The apostle Peter invites us to "throw all [our] anxiety upon [God]." Why? "Because he cares for you." (1 Peter 5:7) And yet, after having done that, you may find that your problems are persisting; in fact, they may even have grown worse. Has that shaken your faith in God, that he is indeed the "Hearer of prayer"? (Psalms 65:2) If Jehovah really does care for us, and he is the Hearer of prayer, why then do our prayers seemingly go unanswered? Is there perhaps something we may be overlooking? As you study God's Word, and you become better acquainted with God's personality―his thoughts and his ways, which are so much higher than our own; and you regularly communicate with him in prayer, with the passing of time you will find yourself developing a trust in your heavenly Father that cannot be shaken in a time of trouble. (Isa. 55:9) Even if your prayer seemingly goes unanswered at the present, you have the assurance that he has heard you and that he will act upon your request at the appropriate time; which is never too late. Keep in mind that Jehovah has his own way and timeline of providing help, which is not necessarily the way you would expect. Help can come from unexpected sources; which prompted one elder to pose the question: "If I pray for something, and then I get it, how do I know that it was from God and not just a coincidence?" Of course, the obvious reply to him was: "Since you received what you prayed for, thank God for it without doubting." That question has been debated for centuries, with many diverse opinions expressed on the subject. Some have explained in great detail, according to their belief, that the main theme of the Bible is God's supremacy, his universal sovereignty, that was challenged in the Garden of Eden. (Psalms 83:18) Others have pointed to God's great love for mankind as the central theme, quoting Jesus' words to Nicodemus. (John 3:16) Then there are those who have attempted to combine those two thoughts. One Anglican minister once suggested that the rebellion in Eden was part of God's greater plan whereby he demonstrates his great capacity to love even sinners, something we would never have known about God if there had been no sin. After all, so his reasoning went, how could an all-knowing and all-powerful God not have foreseen the rebellion and intervened to prevent it―unless he had purposed it. Other suggested themes of the Bible have been: Jesus Christ himself; God's kingdom; redemption and reconciliation with God through Christ; salvation through dedication (consecration); the new covenant; God's righteousness; the reward of all righteous people going to heaven; etc. etc. All these many subjects have been written about and explained in great length by many students of the Bible, often in a manner suggesting that these were the theme of the Bible; when in actuality they constituted important details of the greater picture. 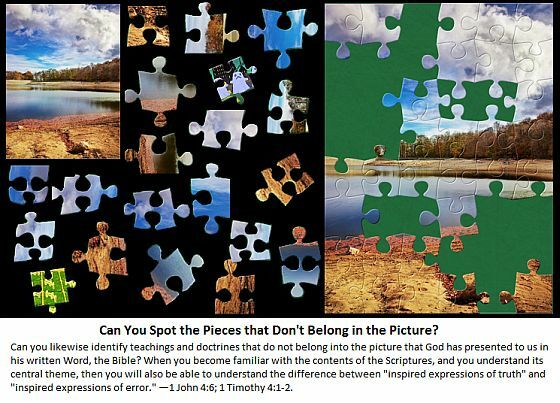 What, then, is the greater picture, the central theme, of the Bible? The apostle John explains very simply: "Whoever makes a practice of sinning is of the devil, for the devil has been sinning from the beginning. The reason the Son of God appeared was to destroy the works of the devil." (1 John 3:8, ESV) This is the theme of the Bible! God's intent to "destroy the works of the devil" by means of the promised seed is what the Bible is about! All the information contained in the Scriptures are recorded to help us better understand the hows and the whys in the larger picture, such as: • God's sovereignty (Dan. 4:17, 34,35; 1 Cor. 15:28); • God's love and mercy (1 John 4:7-10); • the nation of Israel according to God's promise to Abraham (Gen. 22:17,18); • God's kingdom (Matt. 6:10; Dan. 2:44); • Christ's rulership with his "holy ones," the 144,000 (Dan 7:13,14, 27; Rev. 14:1-3; 20:6); • Christ's sacrifice and mankind's redemption (John 3:17,18; Rev. 7:9, 14-17); • God's various covenants; • his laws and dealings with his people; • baptism; • the sanctification of his holy name; etc. All these many details are important pieces in the greater picture, namely, that of destroying the works of the devil. The high council of Jewish aristocrats in Jerusalem was endowed with considerable power in governing the Jewish people. It is traditionally called the Sanhedrin, a translation of the Greek word sunedrion (council). According to Jewish tradition, the Sanhedrin dates from Moses’ choice of seventy elders (Num 11:16), but the earliest datable reference is found in Josephus (Antiquities 12.3.3) from the time of Antiochus the Great (223-187bc). The Sanhedrin probably emerged from a self governing body of leaders under the Persians (see Ezra 5:5-9; Neh 2:16). The high council was always controlled by the priestly class under the leadership of the high priest, though these priests were influenced to various degrees by Roman rulers and Pharisees. Herod the Great exercised a particularly heavy hand over the affairs of the Sanhedrin. The Sanhedrin managed the internal legal and religious affairs of Judaism, including judicial decisions not resolved in lesser courts (called “local Sanhedrin’s), criminal justice and arrests, and official (though unenforceable) decisions regarding Jewish matters (eg Acts 9:1-2). Though the Sanhedrin could not of its own accord put tried criminals to death (eg John 18:31), apparently it could do so with the support of Roman officials. "This takes into account that it is righteous on God’s part to repay tribulation to those who make tribulation for you, 7 but, to you who suffer tribulation, relief along with us at the revelation of the Lord Jesus from heaven with his powerful angels 8 in a flaming fire, as he brings vengeance upon those who do not know God and those who do not obey the good news about our Lord Jesus. 9 These very ones will undergo the judicial punishment of everlasting destruction from before the Lord and from the glory of his strength, 10 at the time he comes to be glorified in connection with his holy ones and to be regarded in that day with wonder in connection with all those who exercised faith, because the witness we gave met with faith among you." The "goats" (who did not know God and suffer the "punishment of everlasting destruction") —2 Thess. 1:8,9; compare Matt. 25:41, 46.